I turned out my shop lights and went outside. Across the street, the Threadville shops had closed for the night, and the last customers were boarding a bus. The sign above the windshield said THREADVILLE TOUR. In a few weeks, I would open my embroidery boutique, In Stitches. I hoped the Threadville tourists would like my shop and would buy sewing and embroidery machines from me. The manufacturers had treated me to fascinating seminars and training sessions where creating and stitching machine embroidery designs was more like play than work. Best of all, as new models came out, I’d be among the first to try them. The bus rumbled away. Drawn to the beach at the foot of Lake Street, I started walking. “Willow!” Buttoning her coat, Haylee dashed from her fabric store, The Stash, and joined me. We passed the other Threadville shops. Opal was tidying Tell A Yarn. Lights were bright inside Buttons and Bows, but I didn’t see Edna. Naomi was sitting at a sewing machine in Batty About Quilts. Threadville had only a smattering of snow compared to the city I’d recently left. “I got out of New York just in time,” I said. I teased, “So now you’re their mother?” Haylee was my best friend and I’d grown fond of her mothers. They couldn’t possibly get me into too much mischief, could they? Find Willow’s biographer, Janet Bolin, on the web, on facebook, and on twitter @janetbolin. I want to visit Threadville--and can't wait till June when I can. Heather, those three women tease each other all the time, and they always seem ready for an adventure. So does Haylee. Uh-oh. I'd better keep an eye on all of them. I can hardly wait to welcome you to Threadville! Wow, I cannot wait to read your adventure, Willow! Can't wait to pick up my copy of DIRE THREADS! My *adventure* Julie? Now I'm scared. Unless, of course, it's an adventure with romance . 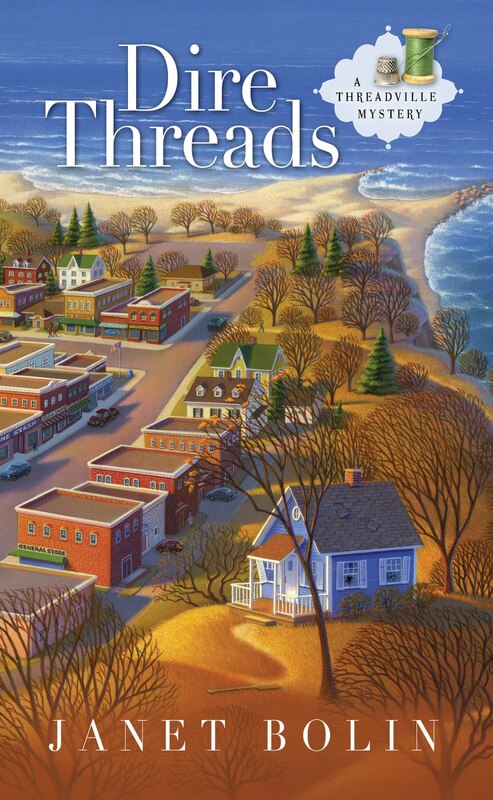 . .
Willow, I can't wait to read about Threadville. It sounds like such a crafty town! Willow, I'm ready to read all about Threadville!!!!! Can't wait to meet you! It is, Avery! I have to resist the temptation to shop in the other Threadville stores all the time for materials for new projects. I need to set up my own store so I can open it. Nancy, thanks for dropping by. It's great to meet you! Willow, watch out for The Three Weird Mothers! They're bound to get you into mischief! But it could be fun . . . I definitely want to visit Threadville and meet everyone, especially the three weird mothers. I can already imagine the havoc, oops fun things they'll get Haylee and Willow into. Krista and Dru, I think you're both right that the Three Weird Mothers could be a lot of fun. We all love making things out of fibers and textiles. And what could be better than having friends right across the street? We can get together for projects, good food, gossip, and laughs. Who will have time for mischief? Okay, I tried leaving a comment and my computer got all weird. I'll try again. I was going to say that I've already read Dire Threads and you are all in for a treat. Sounds like a series I'll read, Janet (and it's located at the beach!) Perfect. Thanks, Betty and E.B.! Betty, be careful. Willow may try to get you to divulge what's about to happen to her.